Ready for a fun game of backgammon? Try this excellent, feature packed and easy to use backgammon game. With superb graphics and 5 skill levels, you won't be disappointed. For all levels of player, from beginner to expert. Can play using your voice. Gives advice on moves and the doubling cube, can take back moves, plenty of help, can pick up more than one piece at a time, shows best moves, can select from many board styles and much more. Farkle is a fun and easy to play dice game. But be careful, it is easy to get addicted. It also goes by other names such as 10,000 and 6 Dice. It is a great game for the whole family to play. In this version, it is just you against the computer opponent. Once you learn to play, you can easily teach others to play. Has many options to select from to play it the way you want to. Gives advice and use the speech built in to every macintosh. Ready for a fun game of backgammon! Try this excellent, top-ranked, easy to use version. Has just about any option or feature that you would like including 5 skill levels for all levels of player. Gives advice on moves and the doubling cube, can take back moves and doubles of the cube, on-line help, can pick up more than one piece at a time, shows best moves, can change board colors and much more. 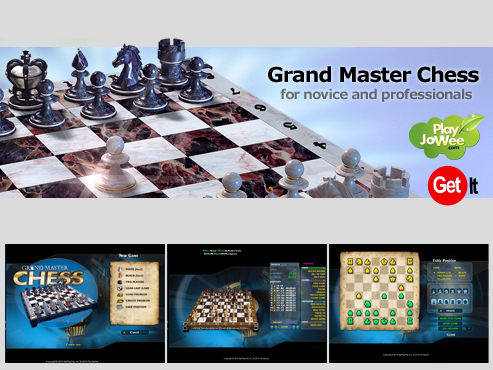 Grand Master Chess III free will help to improve your chess skills and become a better tournament or casual player. You can either have friendly competitions against friends and family members or try solo mode against the computer. Listen to your own music as you play! An incredible level of detail and realistic chess figurines add to the gameplay experience.